Spacecraft line-of-sight velocity: This is the speed along the line-of-sight relative to the asteroid (minus is towards the asteroid, positive is away). Numerical value is displayed only when speed control is performed. 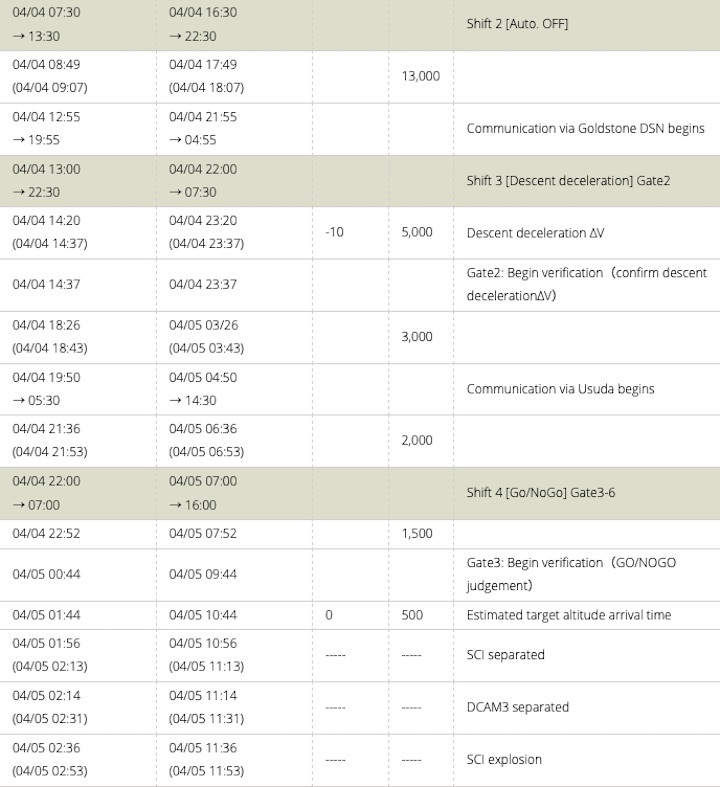 After a speed control operation, the speed changes due to the gravitational force of Ryugu and other celestial bodies. Since the spacecraft line-of-sight velocity and altitude become complicated after the SCI separation, they were omitted here. 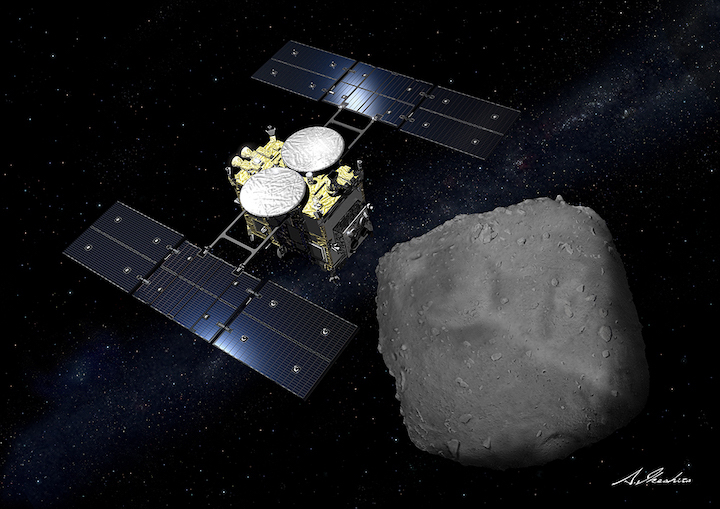 The National Research and Development Agency Japan Aerospace Exploration Agency (JAXA) has carried out operations to separate the SCI (Small Carry-on Impactor) onboard the asteroid explorer Hayabusa2 for deployment to the asteroid Ryugu. The National Research and Development Agency Japan Aerospace Exploration Agency (JAXA) separated the SCI (Small Carry-on Impactor) onboard the asteroid explorer Hayabusa2 for deployment to Ryugu and put the SCI into operation. 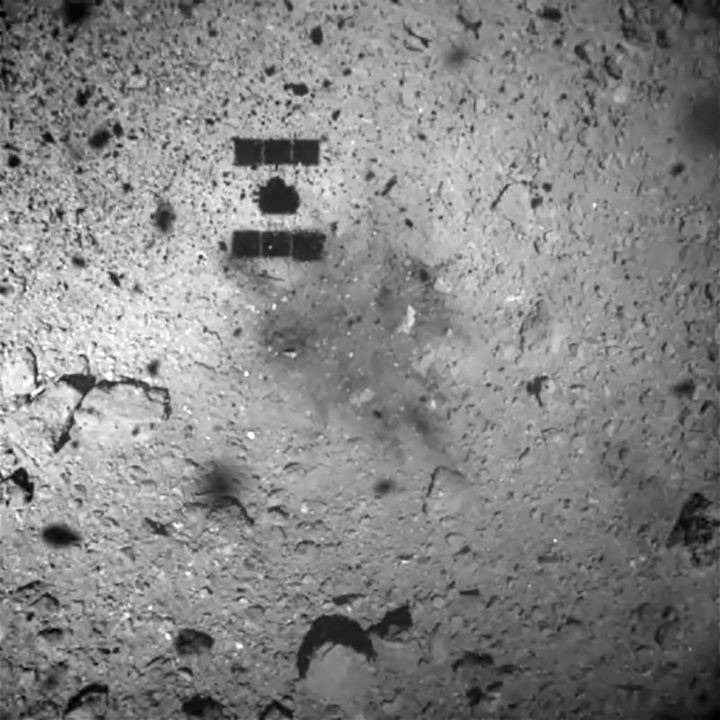 After the start of the operation, the camera (DCAM3) separated from Hayabusa2 captured an image that shows ejection from Ryugu’s surface, which implies that the SCI had functioned as planned. 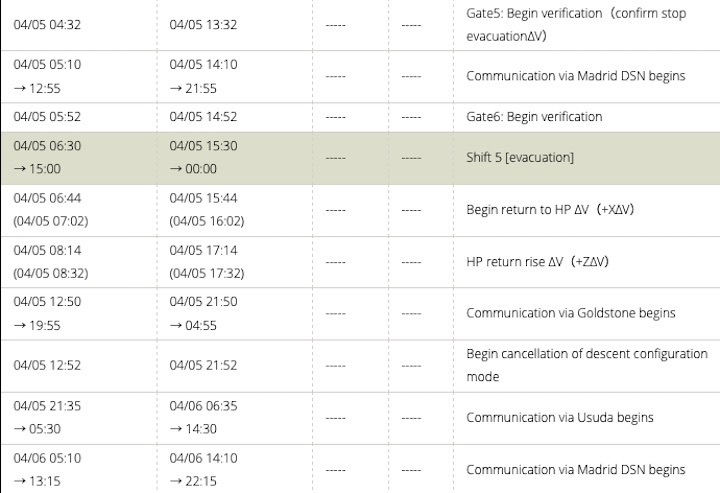 Hayabusa2 is operating normally. We will be providing further information once we have confirmed whether a crater has been created on Ryugu. Yuichi Tsuda, who leads the Hayabusa2 project at the Japan Aerospace Exploration Agency, speaks at a press conference in Sagamihara, Kanagawa Prefecture, on Friday. Space explorer Hayabusa2’s successful operation on Friday to create a crater by striking the asteroid Ryugu with a lump of copper, when confirmed, will mark the first such achievement in the world. The mission is considered to be one of the most difficult for the probe to accomplish. The Japan Aerospace Exploration Agency (JAXA) designed a new impactor specifically for Hayabusa2 to shoot the copper lump at the asteroid, demonstrating the high technology Japan has developed for space exploration. “We successfully established new means of space exploration,” said Yuichi Tsuda, JAXA’s Hayabusa2 project leader, at a press conference on Friday evening, stressing the significance of the latest achievement which built on the foundations laid down by its predecessor, the original Hayabusa. 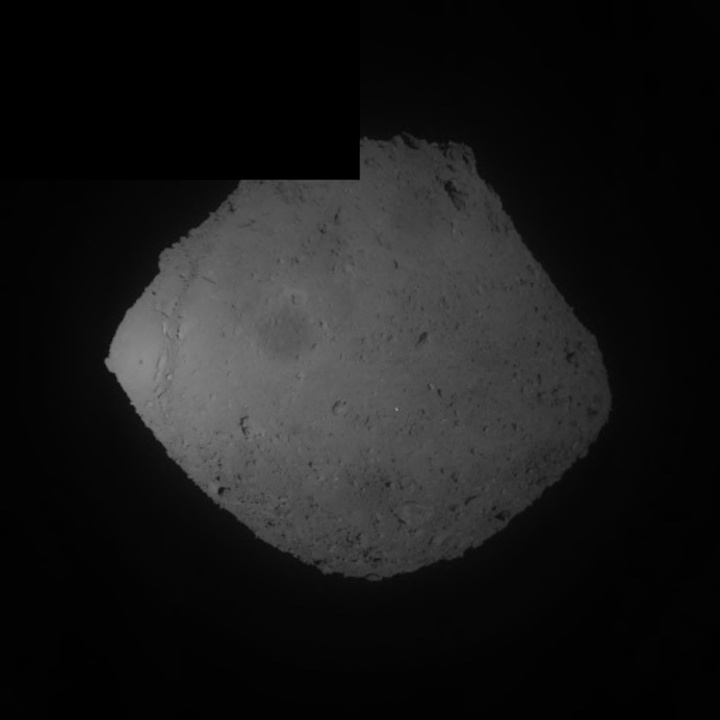 The first Hayabusa probe landed on the asteroid Itokawa in 2005. Hayabusa2, which was built using the same basic design, shares its purpose of bringing back samples of rocks, among other materials, from asteroids to Earth. But if Hayabusa2 was just a rehash, it would be hard to gain public support for injecting a total of about ¥29 billion (about $260 million) from the state’s coffers into the project. 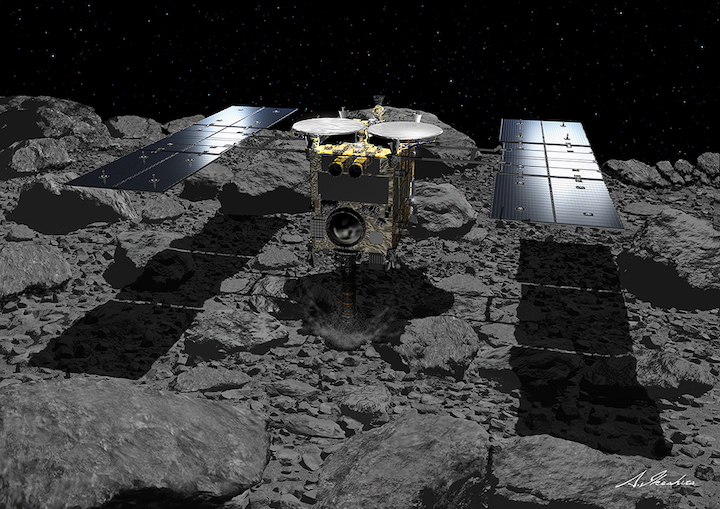 Taking this into consideration, Hayabusa2 was additionally given the unprecedented task of using an impactor to create a crater on an asteroid’s surface to enable it to collect samples from the asteroid’s interior that have not deteriorated or been affected by such factors as sunlight. The conical small carry-on impactor with a diameter of about 30 centimeters works by ejecting a copper plate attached to its base. The impactor ejects the copper plate, which is about five millimeters thick and weighs about two kilograms, using explosive power to accelerate its speed to two kilometers per second and strike it against the asteroid’s surface. As the impactor was built specifically for this task, an explosives manufacturer took part in its development. Aiming and firing the impactor at a point on the asteroid’s surface required meticulous accuracy. It was “like shooting an arrow on horseback while blindfolded,” according to a person close to the project. 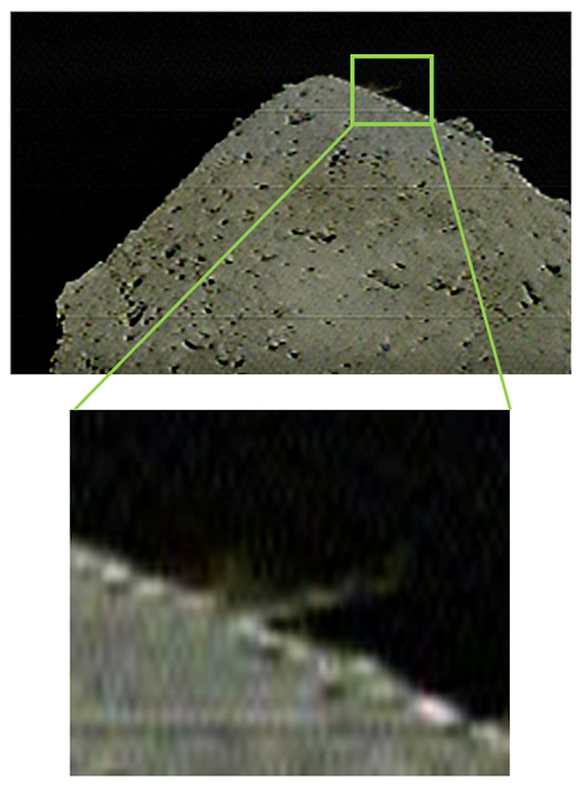 From analysis of images taken by an observation camera, it is likely that the impactor operated as planned, and it is thought a crater was created on the asteroid’s surface as a result. The U.S. National Aeronautics and Space Administration has in the past struck a comet with a lump of metal, but Friday’s attempt is the first such achievement on an asteroid. “The significance of Hayabusa2’s exploration has grown greater. The rest of the world will look to emulate this achievement,” said Junya Terazono, associate professor at the University of Aizu. One major struggle for the project team scientists in the latest mission was how to protect Hayabusa2’s body from debris from the explosion to catapult the copper lump, as well as fragments ricocheting from the asteroid. Hayabusa2 is located about 310 million kilometers from Earth, and it takes about 17 minutes for a signal to reach it, or vice versa, making it impossible to send commands instantaneously. For that reason, the team decided to carry out the mission using an automatically controlled system. The complicated movement, in which Hayabusa2 evacuates while changing its direction a number of times between horizontal and vertical after releasing the impactor and an observation camera, was all programmed into the system in advance. In February, Hayabusa2 touched down precisely on the planned landing site, which is 6 meters in diameter, on Ryugu. 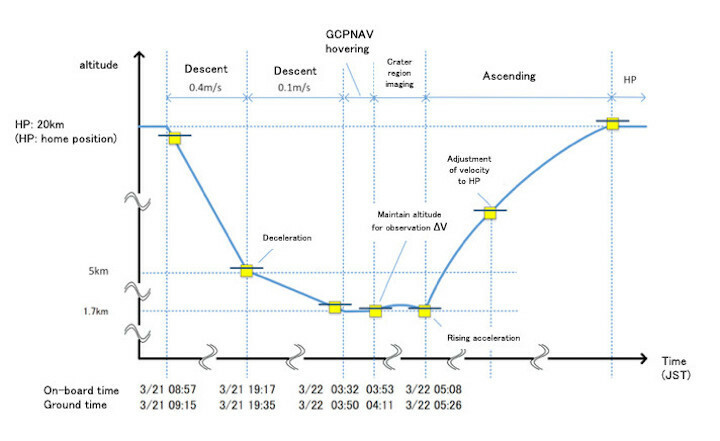 The team members were able to draw from this experience an understanding of the tendencies of each of 12 altitude-controlling reaction wheels installed on Hayabusa2, building up their confidence in probe-control technology. Hayabusa2 will take about two weeks to return to its home position at a 20-kilometer altitude from Ryugu. 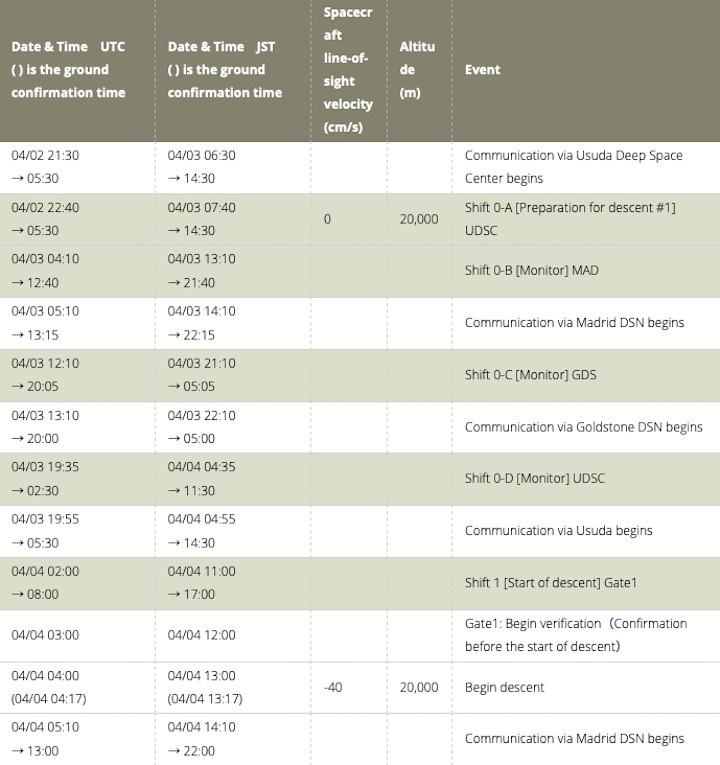 Then after that, from April 22 or later, it will descend to the asteroid to confirm whether a crater has been formed on the surface. At some time as early as May, it will again land on the crater or its vicinity on the asteroid to start collecting samples of fragments. But whatever happens next, the team believes Hayabusa2 has already managed to collect enough samples from its first landing on the asteroid in February. JAXA will weigh up the pros and cons of landing the probe again after carefully assessing the safety of doing so. The announcement comes after the Hayabusa2 probe fired an explosive device at the Ryugu asteroid early this month to blast a crater in the surface and scoop up material, aiming to reveal more about the origins of life on Earth. 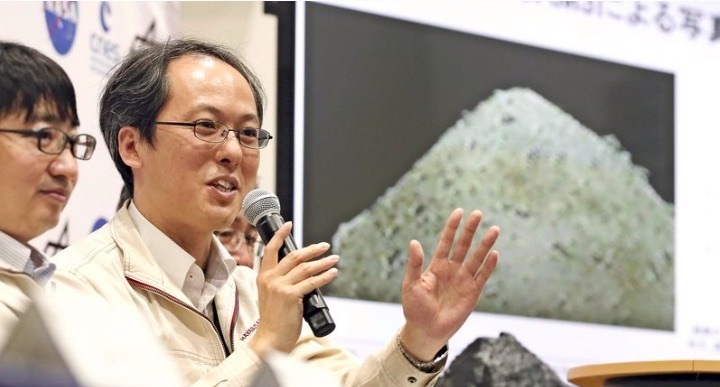 Yuichi Tsuda, Hayabusa2 project manager at the Japanese space agency (JAXA), told reporters they confirmed the crater from images captured by the probe located 1,700 metres (5,500 feet) from the asteroid's surface. "Creating an artificial crater with an impactor and observing it in detail afterwards is a world-first attempt," Tsuda said. "This is a big success." NASA's Deep Impact probe succeeded in creating an artificial crater on a comet in 2005, but only for observation purposes. Masahiko Arakawa, a Kobe University professor involved in the project, said it was "the best day of his life". "We can see such a big hole a lot more clearly than expected," he said, adding the images showed a crater 10 metres in diameter. 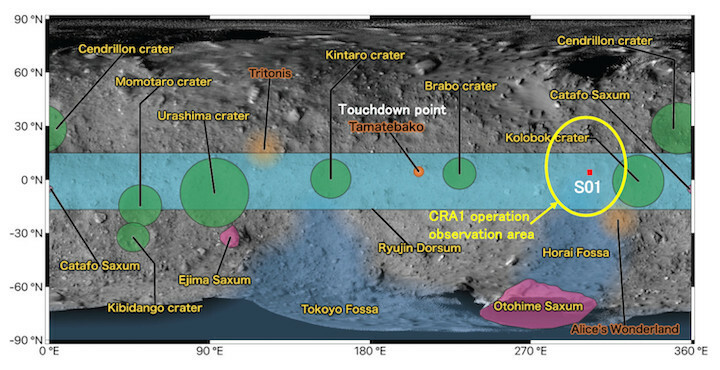 JAXA scientists had previously predicted that the crater could be as large as 10 metres in diameter if the surface was sandy, or three metres if rocky. "The surface is filled with boulders but yet we created a crater this big. This could mean there's a scientific mechanism we don't know or something special about Ryugu's materials," the professor said. The mission, with a price tag of around 30 billion yen ($270 million), was launched in December 2014 and is scheduled to return to Earth with its samples in 2020. TOKYO (Kyodo) -- Japan's Hayabusa2 space probe has successfully created a man-made crater on an asteroid that altered the body's terrain in a historical first, the country's space agency said Thursday. Hayabusa2 had shot a projectile at the Ryugu asteroid around 340 million kilometers from Earth as part of the probe's mission to explore the origin of life and the evolution of the solar system. "The asteroid's terrain has clearly been altered," said Yuichi Tsuda, an associate professor at the Japan Aerospace Exploration Agency. According to the JAXA, the probe photographed the area hit by the projectile from a distance of 1.7 km. The agency compared images of the asteroid's surface before and after the shooting of the projectile to determine the presence of a man-made crater. 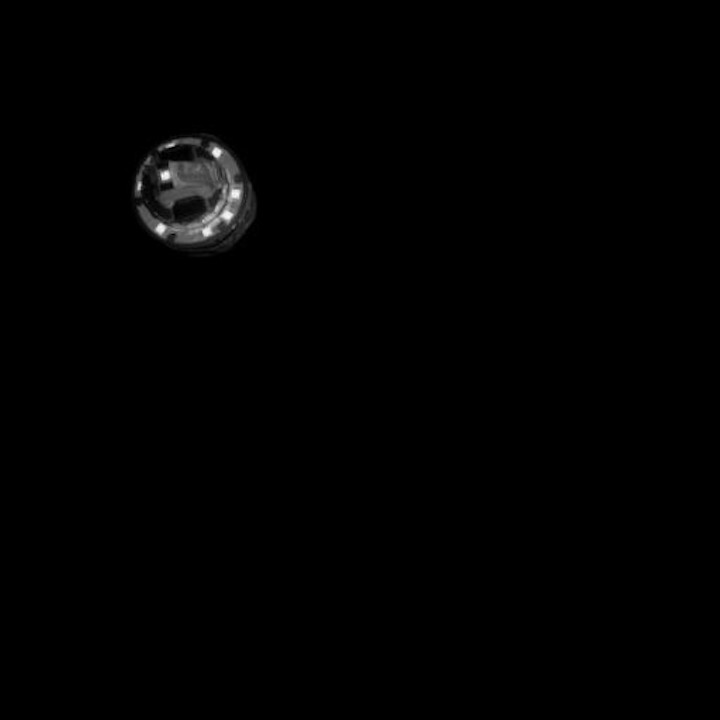 Hayabusa2 shot a copper "impact head" at Ryugu. The agency confirmed a burst of debris caused by the collision. Launched in December 2014 from the Tanegashima Space Center in southwestern Japan, Hayabusa2 reached Ryugu last June. It touched down in February to collect surface samples and found hydrated minerals that will help scientists determine whether asteroids brought water to Earth as hypothesized. Hayabusa2 is due to return to Earth in 2020, according to JAXA. Asteroids like Ryugu are often likened to fossils holding the preserved traces of the time when the solar system was born. But the effects of the solar wind have weathered Ryugu's surface, making it necessary to dig deep to collect such materials.